The Hill Road (Over the Hills and Far Away in the UK), by William Mayne (1968 in the UK, 1969 in the US), is perhaps the most boring time travel adventure to Dark Age Britain I have ever read, and I am pretty much ready to give up on William Mayne (which isn't that hard, what with him having been a child abuser, although I still am very fond of his Hob stories). 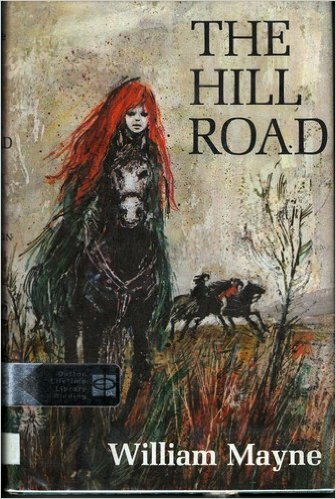 But in any event, I have now read The Hill Road, which is at least a better title than the UK one. So there's this Dark Age girl, Magra, on the Scottish boarder, who has a. red hair (magic!) and b. a magic stone of time travelness (really magic!) and there are bad guys attacking peacefullish villages, and because of her magicness, Magra gets sent off to the big chief guy to share her magic in a helpful way, or possibly to be a ritual sacrifice (neither me or Magra is entirely sure....). And Magra decides that instead of the dangerous journey through her own time, it would make more sense to hop through time to the future. And in so doing, her magic time travel stone whisks three ordinary kids from the 20th century, and their ponies, back in time. The modern kids then have an uncomfortable dangerous journey, sort of like the Dark Ages equivalent of driving down the New Jersey Turnpike the day after Thanksgiving. Nothing much happens. The modern kids get to see Dark Age power struggles and are occasionally in danger. They don't spend a whole lot of time thinking "gee we've travelled through time" and so miss lots of chances to deeply experience what they are going through. And when they get to the end of the journey, Magra pops back into her own time and it is over and nothing has happened in terms of character growth, interesting story, or anything. The modern kids are neither appealing or memorable. According to the jacket flap, this "series of situations" is "as strange and unpredictable and momentous as any this brilliant author has ever offered us." This blog post is just as unenthusiastic as any I have ever offered you all.